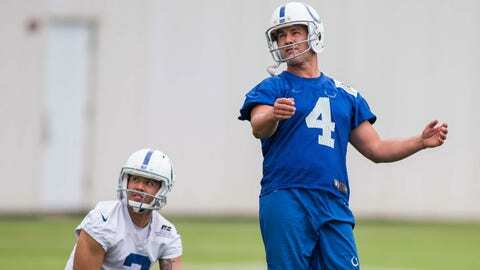 In the midst of his 23rd NFL training camp, Colts kicker Adam Vinatieri looks like a potential Hall of Fame candidate once his playing days are done. WESTFIELD, Ind. — Adam Vinatieri vividly remembers his last game against Morten Andersen. Andersen’s induction provides hope to specialists such as Vinatieri that they, too, could be headed to Canton, Ohio, one day. Until Andersen’s selection this year, Vinatieri wasn’t sure. The only one other “pure” kicker to earn pro football’s highest distinction was Jan Stenerud in 1991. Guy was elected in 2014, ending the shutout for punters. His highlight reel contains some of the most memorable kicks in league history: two last-minute field goals to win Super Bowls and the tying and winning kicks in the infamous Snow Bowl, which helped New England win the first of its five Lombardi Trophies. He has been dubbed the best clutch kicker in league history and there’s no indication “Automatic Adam” is slowing down. He is the last link to the NFL’s developmental league in Europe, the one Andrew Luck‘s father worked with, and one of only two players left from the 1990s. Former teammate Phil Dawson is the other. He played for Hall of Fame coaches Bill Parcells and Tony Dungy, in addition to Bill Belichick. His newest coach, Frank Reich, actually threw for 281 yards against the Patriots during Vinatieri’s rookie season in 1996.